CFY-60A automatic tube filling and sealing machine is a most stable and mature production in our company, which has been manufactured since 20 years back. The machine has novel design, compact structure, multi-function and easy operation in order to meet the needs of domestic and international users in pharmaceutical, food and chemical industries, so it is an ideal tube filling equipment. 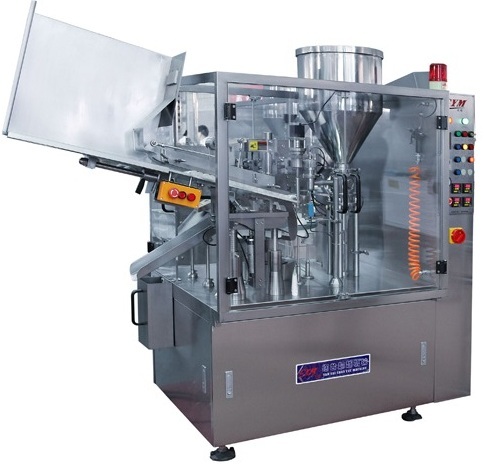 The equipment has 40L funnel, which can control the filling part, successfully pour mushy, cream and mucous material into the tube, then complete filling, sealing and printing for plastics and lamination packing through heat seal and automatically complete the production procedure. l No tube, no filling. System is controlled by precision photoelectric system, and only starts filling action when there is tube in the working position. l Automatically eye mark checking, eye mark matching and positioning equipment, driven by stepping motor to rotate the tube. l Product filling by blowing off and cutting off to ensure better filling for high viscosity products. Precision cooperating filling system and reasonable blowing off and cutting off design ensure filling precision. Its’ easy to assemble and dissemble, and it easy to clean completely. l Stainless steel frame with high visible organic glass. l Easy to connect with emulsifier. l Easy to change parts for different sizes of tubes. l Machine designed with mechanical cam drive, it can control the accuracy and transmission parts processing strictly, so the performance is quite stable. l Machine is designed and assembled with tear free or light tearing parts, Mechanical transmission parts for all bearing linked action, equipment can run over 10 years without big repairing.